This event was postponed three times due to rain and mud aftermath during the last three weeks. Though turnout on the day before Easter was lower than previous work parties, alot was accomplished on this glorious Spring day. The recent rain produced lush growth in the cover-crop/lawn we had planted at the November work party along with a return of a vigorous yield of wild radish. Trimming them with the weed whacker was satisfying and produced a sweet aroma of fresh-cut grass. 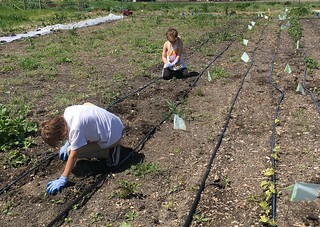 The rain also brought on a plague of cucumber beetles that decimated the rows of peas and beans planted earlier by students. We gave them a chance to recover with the late application of row cover. 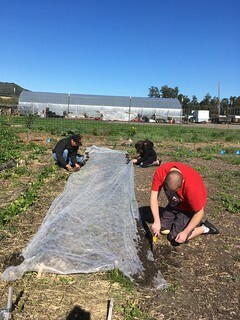 Several rows of winter crops of lettuce, broccoli , cabbage and bok choy were damaged by early heat and late frosts, and these were replaced with new transplants donated by Greenheart Farms. Some our younger volunteers took up weapons in the battle against weeds and managed to dig out even the most persistent of mallows and prickly ox tongue. 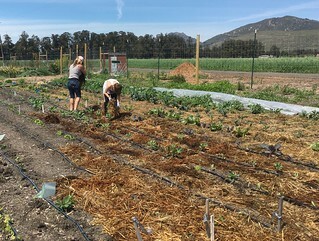 The day’s work concluded with spreading the rotted straw from the bales used for our Fall Harvest Festival Hayride between the rows to prevent future weed growth and crusting of the soil.